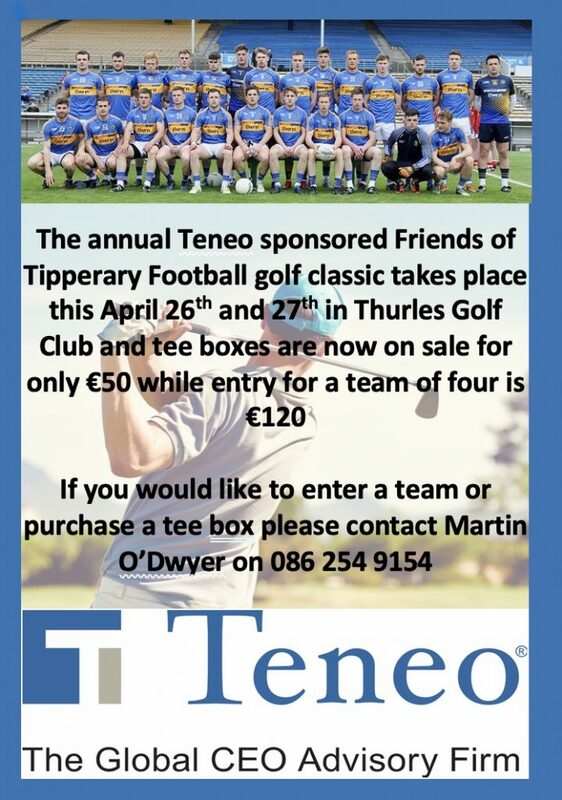 This year the Friends of Tipperary Football are delighted to welcome Teneo, the official sponsors to the Tipperary GAA teams, on board as the main sponsor of the annual golf classic which is once again to be held in the scenic surrounds of Thurles Golf Club. This hugely popular annual event has already seen a large number of teams book their entry and if you would like to secure an entry for your team for only €120, please contact Martin O’Dwyer at 086 254 9154. Tee boxes are also on sale at €50 and once again please contact Martin O’Dwyer at 086 254 9154 for your purchase.